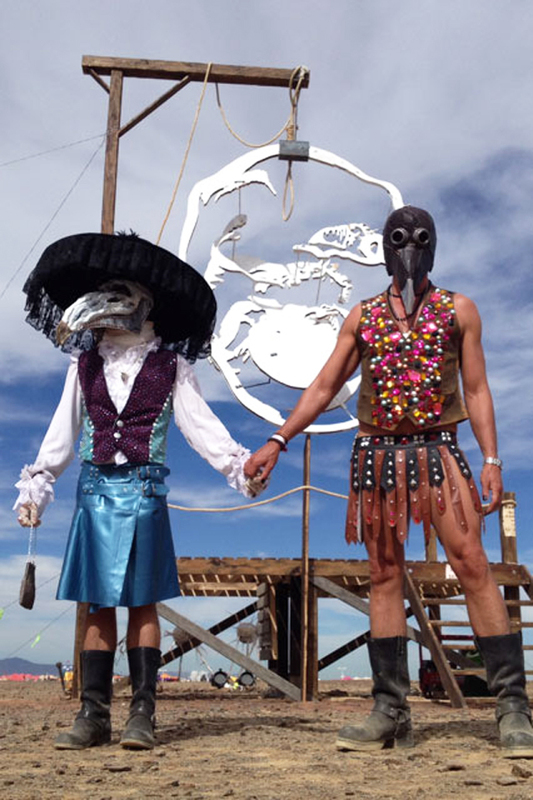 I didn’t get to go to AfrikaBurn in the Karoo last week but I’m going to live the experience through writer, designer, decorator and a really cool friend of mine Andre Carl. 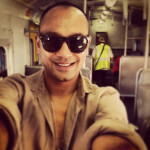 Andre is known for his many talents, including the book Moffie, a beautifully written novel exploring apartheid and gay sexuality and also for his amazing T-shirts sold under the label Vents Brull, that he manages with his partner Giovani. They are sold online at Zando and at Big Blue and you can also find some of his cool graphic Tees at Woolworths under the EST label. After chatting with him at dinner the other night, I thought it would be amazing for us to hear firsthand about his installation and to get the lowdown on who went, what they wore and to share his amazing visuals with you. 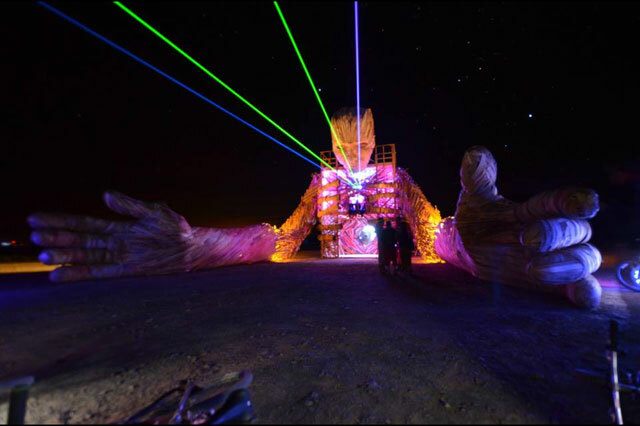 Umashan: Andre, AfrikaBurn is now a highly recognized event that celebrates humanity, art and culture and has become an epic event. How did you become involved? Andre: By default really. A number of years ago two friends and I decided at the last minute to attend (one could still buy tickets at the gate four years ago). I was so deeply touched by the spirit and the people. Mostly though, I absolutely loved the gifting economy, not bartering – gifting – which seemed to release a radical humanity – people over-gave instead of trying to free-load. When I drove away that year I decided that the following year I would gift a bar and an artwork with my friends – which we did. It takes months to create and plan your installation I know you are passionate about art, conservation and your use of storytelling and media to evoke emotion and thought. 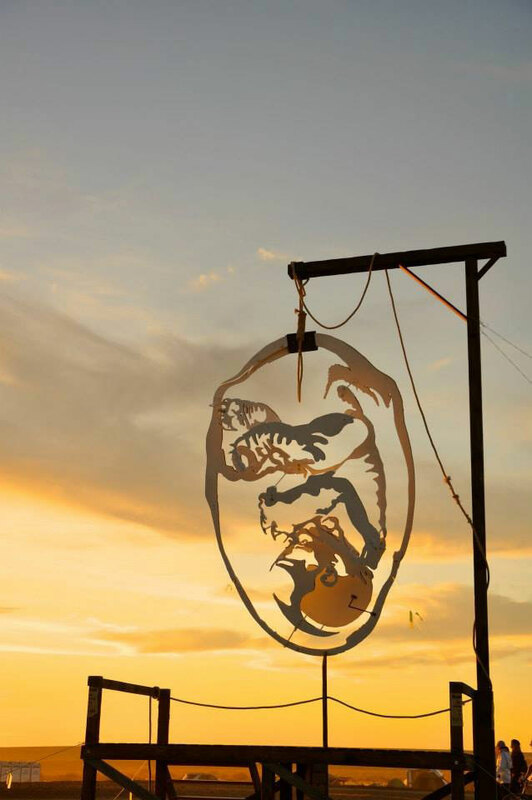 Tell us about the work you showed at AfrikaBurn. The work was called Many-one-none and consisted of a ‘cloud’ of shapes that represented species that have become extinct in the last year. The cloud hung from gallows. At one point in the day, when the sun shone through the ‘cloud’ of random shapes it projected the shadow image of a baby in a womb onto a screen. My artistic reasoning was: MANY species are impacted by ONE which may result in NONE. We had an accident the Wednesday before – the sculpture over-balanced and smashed – the time it took to rebuild it did not leave enough time to complete the screen and unfortunately the registration was a little out, so we invited the viewer to observe the sculpture against the light of the red karoo dusk, when the image flattened and could be seen. We lit the sculpture with flame throwers on the Friday, shortly after dark. The images are amazing and this week is certainly inspiring! A week of forgetting worldly processions and being human are some of the major themes of the event, how did you and Giovani plan your week and what did you wear? Giovanni made the outfits and they were truly remarkable. 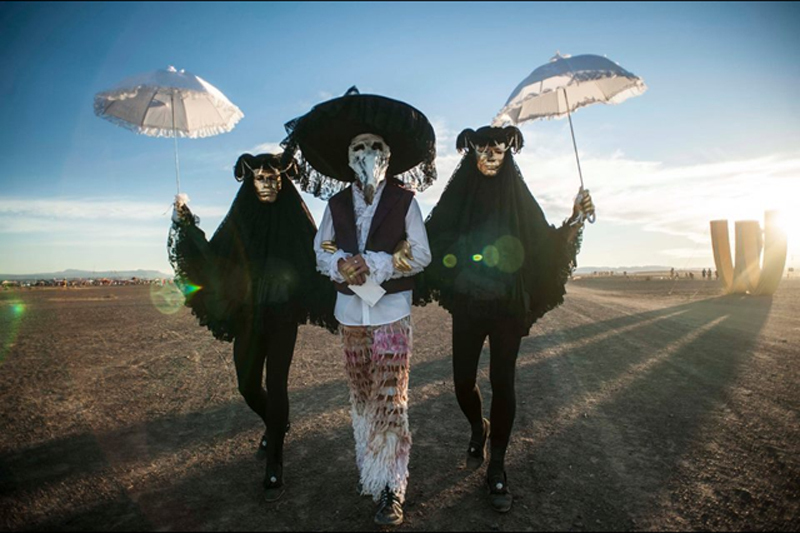 They were inspired by the Venetian mask carnival, ancient Roman gladiators, The Hunger Games, costumes from the 1700s and plague doctor costumes. I heard there was a special landing pad for celebrities who jetted in. Who did you bump into and who was milling around incognito? Im not sure exactly who was there among the 9,000 people who attended, but if ever there was an opportunity to be incognito, this event would be it (if they dressed well of course). Can you describe your most memorable moment? The burns are always memorable and also the generosity. I guess my most memorable experience was last year. I was walking across the Binnekring on a Saturday night and a storeys-high egg started burning, cracking open and revealing a huge T-Rex on fire. It actually walked out and chased some ‘exotic birds’ that were the size of cars. Meanwhile, a blazing polar bear was swimming around looking for ice (a statement on global warming) two enormous bunnies were twirling and boxing and behind that a massively high pendulum was turning – sending clouds of sparks into the desert sky. 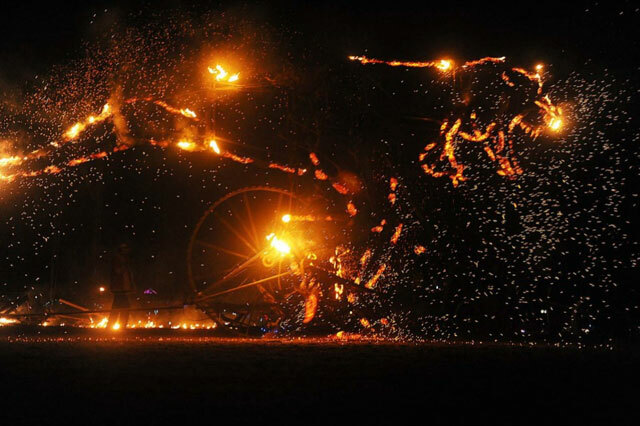 A Mad Max-style truck was spewing fire from a flame thrower and shooting water and fireballs. A double-decker bus arrived and the roof opened to reveal a club, with a Star Wars R2-D2 robot projecting lasers agains its sci-fi inspired side. What were some of the trends hat people were sporting? People are extremely creative. I can’t say that I observed a specific trend but I think people try very hard to do something so outlandish, unique and diverse that you see an enormous variety. 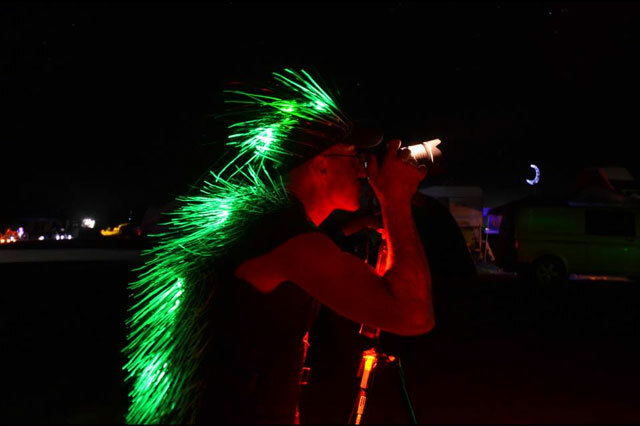 An example is a porcupine outfit made of thousands of cable ties, all lit internally with LED lights. Are you going back next year? Yes, for sure. 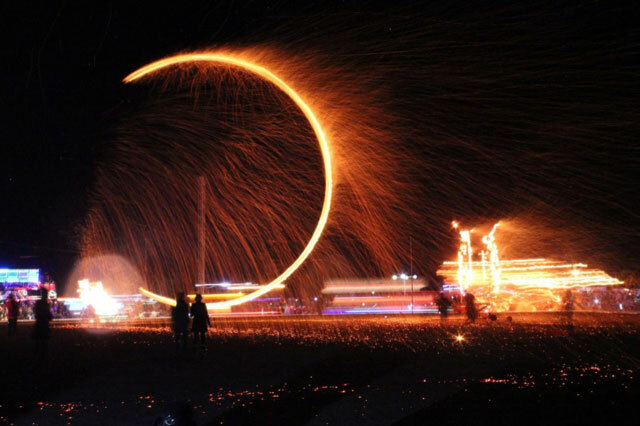 I want to do a very large sculpture that walks or moves while on fire, across the playa (display area). I also hear that you’re planning something on the promenade in Seapoint? Is this a surprise? Yes, it’s actually a sculpture that grew from a work I conceptualised for AfrikaBurn some years ago with friends. It consists of seven random, unrecognisable parts, but when viewed through the sites of a rifle from a designated point on a viewing platform, it forms a Rhino. The base of the ramp leading to the viewing platform will show statistics of Rhino slaughter over the last 10 years and the platform itself we will indicate the monthly slaughter. South Africa’s talent really is endless and I’m definitely going to try to get my posse to Africaburn next year! Celebrate creativity and burn the oppression! Thanks to Andre Carl for his time and photography.